Getting off the bus number 3 at "GARDIOL", you will see beyond the bus stop a big grey school, and on its left a little footpath in yellow pebbles that runs alongside the school. Go all the way on the small footpath, leaving the school on your right. Please do not go towards the shops (Migros and post office) those are in the wrong direction. Continue straight, cross the small street, go straight on. Our clinic is situated in the tall white building with orange fabric blinds just in front of you. Our street number is 26, Ch.F.-Lehmann. A few stairs, then press the Clinic's intercom and the front door unlocks automatically. We are on the ground floor, on your left, at the end of the corridor. Cross the road (Route de Ferney) at the pedestrian crossing. Follow the pavement (along a field). At the next pedestrian crossing, cross over the little road (Rue du Chapeau du Curé) and then descend the sidewalk going down this little road for a few steps.Turn left after the red/grey school, into a small pedestrian path that leads to our street (Ch. F.- Lehmann). Our road contains several tall white buildings with orange or green blinds).Our building is the first on your right. We are at number 26, ground floor.Ring, the door unlocks automatically, welcome! Leaving behind the train station, you can take Rue de la Servette, then straight ahead, in the direction of the airport, follow Avenue Louis Casaï. Go straight (you pass the mall Balexert and the multicolored buildings Avanchets on your left, then take a right at the traffic lights (direction "Grand-Saconnex"). Do not go as far as the airport. Continue straight on after the traffic lights (chemin Terroux). Pass a small group of businesses and shops (Denner, Pharmacy, Tobacco, Coop), then take the first road on the right (direction "Ecole La Tour"). This is our street (Chemin François-Lehmann). Follow directions "Grand-Saconnex". This will make you turn around the airport, to reach the exit "Grand-Saconnex"Take this exit then turn right towards "Grand-Saconnex"
Continue straight ahead to the main square of Grand-Saconnex (bank BCGE, Pharmacy, Primary School) and at the traffic lights, choose the RIGHT road that goes into Grand-Saconnex (Chemin Sarasin). Then take the first left (direction Ecole La Tour), this is our street. Continue straight, up to the top of the road and park in our private parking spots: the squares are marked with a red/pink round on the ground. If you prefer, you can park on the street, but this requires a blue parking disc. Our building (number 26) is very close. Take exit number 7 "Grand-Saconnex"
Continue straight, up to the top of the road, and park in our parking lots: just before the school, the squares are marked with a red/pink round on the ground. If you prefer, you can park on the street, but this requires a blue parking disc. On the main square of Grand-Saconnex, take a right at the traffic lights then a left so as to turn around the square. At the lights, take a left and you are once again on the “route de Ferney”, but in the other direction. Thankfully no road restrictions this year, so you can drive to our clinic from either side without hindrance. As every year, gates and guards will be posted at the entrance to chemin François-Lehmann. Please let them know you have an appointment with Dr ROUX and they will let you pass. 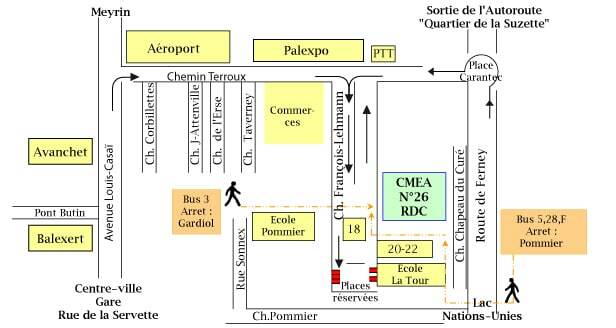 During the Palexpo Auto Show, the maximum parking time is reduced to 4 hours on our street. Please do not to forget your blue zone disk, because many controls are carried out! We also have 5 private parking spots very close to our Clinic (situated in front of the school La Tour). Please look at the map to clarify where the parking is situated. Our private parkings are identified by red dots painted on the ground.